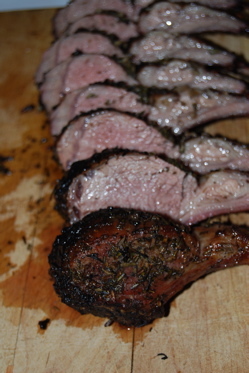 Here is a grilled rack of lamb recipe that I threw together recently and turned out beautifully. Rack of lamb is one of the most elegant and refined cuts of lamb. Not as gamey as leg of lamb, it has a juicy, succulence and tender texture which is absolutely delicious. Even my wife who doesn't normally love lamb dishes gobbled this up excitedly! Rack of lamb - Cut off any excess fat, leaving a fairly lean rack. One rack will serve only about two as a main course (or less if you are really hungry!) so make more if you are serving more. Dry white wine - You only need a cup or so. Mixed fresh Provençal herbs - You can use whichever combo you want but I used a roughly equal mix of rosemary, thyme and oregano. Chop them finely together. You will need a few tablespoons for each rack of lamb you make. Garlic - About 3 or 4 cloves, finely minced, per rack of lamb. After trimming your rack of lamb and chopping the herbs and garlic, rub coarse salt and black pepper into all the surfaces of the meat. You can season to taste but this rack of lamb recipe is quite good with ample salt, if you like that kind of thing. Next, put the herbs and garlic in a small bowl and add enough dry white wine to make a slurry or paste. Rub this garlic/herb mixture thickly over all the exposed surfaces of meat on the rack of lamb. Place it in a shallow dish or bowl, pour over the remaining bit of wine and cover. Marinate about 2 to 4 hours. After building a fire in your grill, push the embers to one side or to two sides so that you can cook with indirect heat. Allow the meat to come up to room temperature prior to cooking. Season the meat additionally if you prefer and lightly brush off any excess herb mixture from the surface. However, it should stay well coated with herbs and garlic. Throw the rack on your grill over the coals with high direct heat. You want to sear the surface briefly, just enough to get a bit of a dark brown crust forming but not to burn it. When one side is seared, flip it and allow the other side to sear as well. Once seared on all sides, move the rack of lamb away from direct heat so that it is not over hot coals. You can baste a bit with additional wine and/or olive oil to help keep it moist and to help it develop a nice crusty surface. Cover with your grill lid and let cook on indirect heat for 15 to 20 minutes, or until done to your desired doneness. It should be a bit pink in the middle still when finished. Remove from the grill and let rest in a warm place under foil for at least 10 minutes. Then slice into either individual ribs or double servings, two ribs per piece. Serve and enjoy! I have served this with either mint or rosemary jelly and both are excellent accompaniments to this grilled rack of lamb recipe, although the rack is great on its own as well. Done with the grilled rack of lamb recipe? Return to the Barbeque Grill Recipe page.